A couple of weekends ago Farilla and I tore ourselves away from the splendor of the Beach House for an adventure. 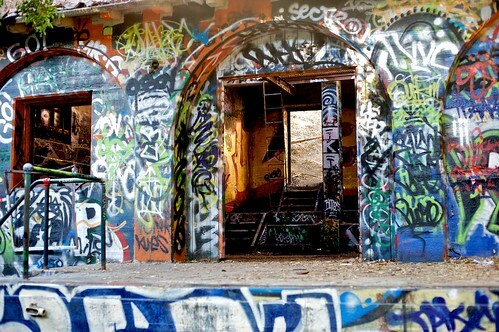 I took him on a hike in Topanga State Park to the ruins of an old 1930's Nazi Commune turned modern day graffiti sanctuary. 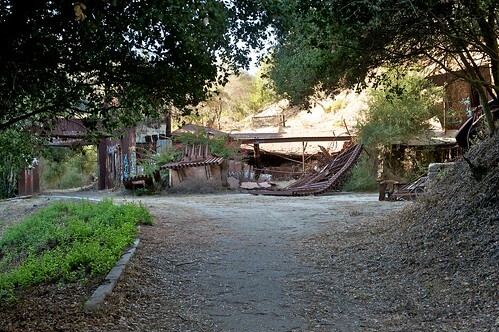 History: In 1933, an heiress named Winona Stephens purchased fifty acres from Will Rogers on property that is now Rustic Canyon (now part of Santa Monica Parks and Recreation). According to records in the Los Angeles Historical Society Archives, Stephens became engaged to an official of the Nazi Party named Herr Schmidt. He convinced her to invest four millions dollars of her fortune in a self-sufficient community which could survive a potential attack during WWII. As records indicate, the renowned Frank Lloyed Wright was commissioned to draw architectural sketches of the main buildings. In the drawings are terraced orchards, a powerful electric fence, a diesel-powered generator, a 395,000 gallon water tank, an Olympic sized swimming pool, and extensive networks of staircases scattered along the walls canyon. The stairs were believed to be used by guards for patroling the property. A year or so after construction was completed, rumors spread over late night military drills and loud gun-fire. Police records show that Herr Schmidt was arrested one day after Pearl Harbor was bombed. A short wave radio device was confiscated at the site. Pacific Palisades Historian Betty Young notes, "Herr Schmidt died immediately after, in prison." It was a stellar afternoon despite the Sunset Boulevard crawl back to the Beach House caused by the Chautauqua grass fires. For a few more snaps from our afternoon click here. You still rockin' with the 50 on the D700? Yep, I hardly ever take that lens off my camera. love it! Very interesting. A Nazi camp in CA - who knew? 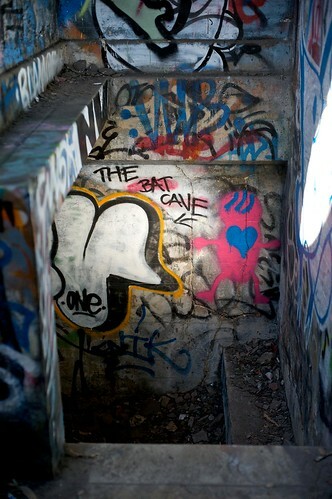 Reminds me there's an abandoned mental hospital near Olympia WA that I want to check out sometime -- graffiti sanctuary also. Abandoned Mental Hospital! Simply Spooktastic, J9! You must check it out! I can't wait to see your pics.